Africa may be full of democratically governed countries, but it is still the land of many kings. Sure, there are only three African countries with constitutional monarchies – Morocco, Swaziland and Lesotho — but there are several hundred traditional monarchs dispersed across Africa in urban, semi-urban and rural communities in independent countries. Mostly, these monarchs wield little or no formal political power, but they fulfill spiritual and ceremonial obligations to members of their community. Being a traditional monarch in Africa can be a lucrative affair. A significant number of these rulers are formally recognized by state institutions and as a consequence, many of them receive generous stipends and allowances from the government. For example, King Goodwill Zwelithini kaBhekuzulu, the traditional King of the Zulu people, South Africa’s largest ethnic tribe, receives an annual allowance of about $6 million to cater to the needs of his royal household. He also gets to enjoy other perks like frequent private air travel and keeps an exotic collection of automobiles, all paid for by South Africa’s taxpayers. Many African monarchs also earn a significant income through the goodwill and generosity of their communities. It is not uncommon for wealthy members of a tribe or community to give substantial sums of money, cars, land or houses to their traditional Kings in return for spiritual blessings or unrelated favors. And since these traditional monarchs may wield significant influence in political circles, some of them get invited join boards of large corporations. Obi Nnaemeka Achebe, the Obi (King) of Onitsha, a mid-sized commercial town in Nigeria’s southeastern region, serves as the Non-Executive Chairman of Unilever Nigeria, a large publicly-listed manufacturer of consumer goods, and he previously served as Chairman of Diamond Bank, a leading Nigerian commercial bank. Oba Adedotun Gbadebo, who is the Alake (King) of Egbaland, a clan of Yoruba-speaking people in Nigeria, is the Chairman of Oando, a large Nigerian energy company. His Majesty King Mohammed VI of Morocco is the wealthiest monarch in Africa. He derives his fortune from his control of Société Nationale d’Investissement (SNI), a large Moroccan investment holding company with assets valued at more than $10 billion. SNI’s largest asset is a 48% stake in Morocco’s largest bank, Attijariwafa, as well as controlling stakes in mass distribution giant Marjane Holding; mining company Managem Group and mobile telecoms company Inwi. The King also owns a substantial chunk of the world’s phosphate reserves. King Mohammed VI, the 27th king of the Alaouite dynasty, ascended the throne in July 1999 and immediately set out to initiate a series of socio-political and economic reforms that have made the Kingdom freer and more prosperous than during the reign of his father, King Hassan II. In 2014, the King introduced a new family law giving women legal equality with men in key areas; his economic strategy has led to the creation of new industrial zones which in turn has given a boost to the number of global industrial corporations setting up shop in Morocco. On the political front, he has enacted a series of reforms to the country’s constitution, including amendments that stripped him of some of his political powers. Oba Obateru Akinrutan is the Olugbo (traditional King) of Ugbo land, a small oil-rich community in Ondo state, in Nigeria’s southwestern region. Oba Akinrutan, who ascended the throne in 2009, is also the founder of Obat Oil, one of Nigeria’s largest privately-held oil trading companies. He founded the company in 1981 with a single gas station to meet the needs of his family and neighboring community. OBAT Oil now owns more than 50 gas stations across Nigeria as well as one of the largest tank farms in Africa- a modern storage facility that has the capacity to store 65 million liters of petroleum products. He also owns an extensive portfolio of prime commercial and residential real estate in London and Nigeria, including the landmark Febson Hotels and Mall in the Central Business District of Abuja. Alayeluwa Oba Okunade Sijuwade, Olubuse II, is the traditional King (Ọọ̀ni) of Ile-Ife’, an ancient city located in Osun state in Nigeria’s south-western region. Ile-Ife is generally believed to be the traditional home of the Yoruba civilization. Oba Sijuwade, 84, who ascended the throne in 1980, is also a prosperous businessman. The Ọọ̀ni firstcut his teeth in business by working in his father’s trading business as a teenager before going to the United Kingdom to study for a degree in business. Upon his return back to Nigeria, he worked as a manager for the Leventis Group and as a sales executive for National Motor. He struck out on his own in 1964, when he started WAATECO, an automotive distribution business that imported vehicles and vehicle parts from the Soviet Union to sell in Nigeria. He went on to build the Motel Royal hotel and several residential and commercial properties. He is the founder of the Sijuwade Group, a Nigerian conglomerate with interests in oil & gas, construction, property development and hospitality, which he incorporated in 1975. The group owns stakes in two onshore oil blocks in partnership with London-listed energy giant Centrica PLC as well as a construction outfit that handles large-ticket road construction projects in Nigeria and was awarded a concession by the Federal Government to construct and manage a tollgate along the Ibadan-Ife dual carriageway- one of the major vehicular routes in Nigeria. The King also owns several residential properties in Nigeria and the U.K.
Africa’s last absolute monarch is more well known for his relationships with women (he had at least 15 wives at the last count), and for his flamboyant parties. He turned 46 recently, with his birthday coinciding with the Christian Easter holidays. Not willing to share the spotlight with Jesus, King Mswati postponed his birthday celebrations for five days so that a proper national holiday could be held in his honor. American R&B artist Erykah Badu performed for the King during the expensive celebrations, irking thousands of human right activists. Reason: The poverty rate is escalating – more than 65% of the Swaziland’s population gets by on less than $1.25 a day, while unemployment rates are as high as 40% — but the King remains unaffected. The King is one of Africa’s wealthiest royals. His personal net worth is at least $50 million, based on the annual $50 million salary that he is paid out of government coffers. He also controls Tibiyo TakaNgwane, an investment holding company that owns stakes in sugar refining giants Ubombo Sugar and Royal Swaziland Sugar Corporation (RSSC), dairy company Parmalat Swaziland, spirits manufacturer Swaziland Beverages and hotel chain Swazi Spa Holdings. The company has assets worth over $140 million, but he holds it in trust for the people of Swaziland. Otumfuo Osei Tutu II is the King of Ghana’s gold-rich Ashanti kingdom, home to the country’s largest ethnic group, the Asantes. 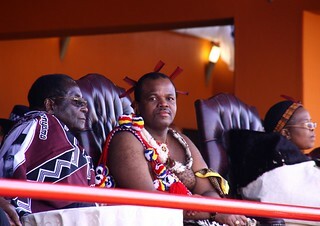 He ascended the throne in 1999 and serves as the political and spiritual head of the Asante people. After studying in the United Kingdom, Osei Tutu II worked briefly in private and public organizations in the United Kingdom and Canada before returning to Ghana in 1989 to set up Transpomech Ghana, a $12 million (sales) company that provides mining equipment to several large industrial companies in Ghana. The King also owns extensive real estate in Ghana and South Africa as well as a collection of valuable gold crown jewels. Posted on 16th June 2014 by newsafrica. This entry was posted in Africa, Corruption, Democracy, Dictatorship, Morocco, Nigeria, Swaziland and tagged Africa, Chairman, Ife, King Mohammed VI, Morocco, Nigeria, Otumfuo Osei Tutu II, South Africa. Bookmark the permalink. « Argentina is 97% “White”?